Giving Nature a Home in Glasgow The leaflet for Glasgow Wildfest 2016 is here! Glasgow Wildfest 2016: four weeks of wild fun at venues around the city, with activities for all and loads of opportunities to get involved! We’re very excited to announce the launch of our leaflet for the 2016 Glasgow Wildlife Garden Festival! 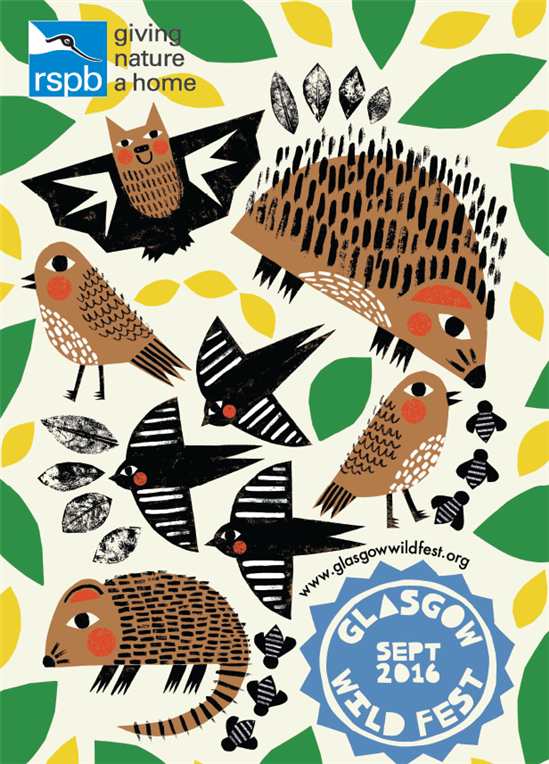 The first thing you might notice is that we’ve had a bit of a re-brand, and the festival is now called Glasgow Wildfest, which is a bit less of a mouthful! You’ll also notice the wonderful new artwork by Hazel Dunn, and we’ll hopefully have a blog from Hazel in a couple of weeks explaining how this was created. This year the theme of the festival is 'nature’s architects' in honour of the Year of Innovation, Architecture and Design 2016. There are a number of events that specifically focus on this topic, such as the ones at the Botanics, RSPB Scotland Baron’s Haugh (a new venue for the festival this year) and Maryhill Park. Pacitti Community Garden is another new venue, as is Hogganfield Park, which has a whole day of family activities planned. But the old favourites are also back with regular events at parks and gardens right across the city, from Pollok to Castlemilk, Bellahousten to Rosshall and many many more. On the first Saturday, we’re kicking off with a special day of activities at Kelvingrove including a fantastic exhibition in the museum by artist Luca Nasciuti, who’ll also be running sound walks in the park. You can join him, or take part in the medicinal and wildlife walks, as well as lots of other fun things to try during the day. You can download the leaflet below, or the events will also be listed on our events page soon.